Peace Also Brings New Currency to Southern Sudan The former rebels in southern Sudan are making money. Literally. The Southern People's Liberation Movement is working to introduce a new currency to replace dilapidated and filthy Sudanese Pound notes. The former rebels in southern Sudan are making money. Literally. The Southern People's Liberation Movement is working to introduce a new currency to replace dilapidated and filthy Sudanese Pound notes. These new bills in South Sudan feature identical serial numbers and the name of a bank (Bank of New Sudan) that doesn't exist. To Africa now, where part of the nation of Sudan is having trouble with its money. A peace deal earlier this year granted southern Sudan some autonomy, and the region's administrators have introduced a new currency. It's printed on plain paper. It has no security features. Many of the bills have the same serial number, and some have none at all. NPR's Jason Beaubien reports. Each night in Rumbek, the new capital of south Sudan, there's a cattle auction on the edge of town. The lean, white cattle with long, thick horns sell for around a hundred dollars apiece. The auctioneer rings a brass bell as he completes another sale. BEAUBIEN: Then to pay for the animal, the buyer hands over several bricks of tattered Sudanese pounds. The old Sudanese pounds were printed in the early 1980s, before the civil war broke out. The Islamic government in Khartoum eventually switched to the dinar, but the Sudanese pound remained the dominant currency in the south. 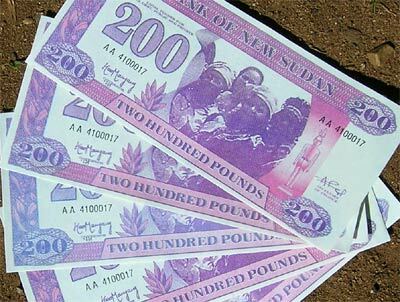 Now, according to Samson Arap Ephraim, the general manager of the Nile Commercial Bank in Rumbek, the Sudanese pound notes are being replaced because they're filthy. Mr. SAMSON ARAP EPHRAIM (General Manager, Nile Commercial Bank): Those ones were really very contaminated, and they can easily, you know, impart disease to other people. You can not even be able to handle it. But now you can have a fresh note. BEAUBIEN: The new bills were printed in 2002. At the time, the then rebels planned to introduce their own money in south Sudan as a way to proclaim their independence from Khartoum. Last month, the former rebels, who now call themselves the Sudanese People's Liberation Movement, or SPLM, declared that all currencies in its territory, including dollars, must be exchanged for new Sudanese pounds. Arap of the Nile Commercial Bank says the old Sudanese pounds are being burned to make sure none of the exchanged notes reappear in the market. But with no administration in place and no serial numbers on many of the new bills, there's no official oversight of the currency conversion. BEAUBIEN: In Rumbek's central market, the new Sudanese pounds are trading at a slight discount to the old pounds. The new bills are generally accepted, but not necessarily well-liked. Mr. THOMAS SUBA (Merchant): This money is not real, and they are fake. BEAUBIEN: Thomas Suba runs a shop that sells two products: beer and a popular brand of cookies called Glucose Biscuits. He calls the new money fake, and says he prefers the soiled old pounds. Suba points out that the new notes tear as easily as the pages in his receipt book. The ink runs if it gets wet. The printing on some of the notes is so out of focus, it's illegible. And across the top, they say they're issued by the Bank of New Sudan, a bank that doesn't exist. Suba says that the color varies so much on the bills that it's hard to know which ones are real. Mr. SUBA: It is too difficult for me to identify them, because those one here they have in different colors, but they're all the same money, but they have different colors. Others are green, others are red, and that's why people are just complaining for. BEAUBIEN: Samson Arap of the Nile Commercial Bank concedes that the printing quality of the notes is quite poor, but he's not worried about counterfeiting because anyone who does, he says, will be put in front of a firing squad and shot. Arap says he doesn't know where the new notes are printed, but the stockpile of bills is controlled by the SPLM. Western diplomats in Rumbek are wary of publicly criticizing the SPLM, but privately, some say the new currency opens up numerous avenues for corruption, and the entire process could be a disaster. In 1995, for instance, Angola rapidly introduced a new kwanza. The move quickly wiped out the meager savings of most of the rural population. In Somalia, warlords have tried to issue their own currencies and sparked hyperinflation. 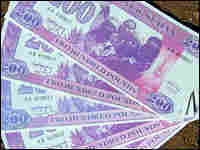 In 1998, Eritrea reignited war with Ethiopia, in part by declaring that it was replacing the Ethiopian birr with the new currency, the nakfa. David Gressly, the United Nations' top official in southern Sudan, says a new currency is a very sensitive issue, and he was surprised by the introduction of the new Sudanese pound. Mr. DAVID GRESSLY (United Nations): I do think that there are reasons to be concerned of how this was introduced and what the long-term impact of it will be. There is a plan to introduce a formal currency. The IMF is working with the SPLM in terms of that introduction. BEAUBIEN: And this is part of what makes the new Sudanese pound even stranger. Under the peace deal signed in January, the SPLM and the government in Khartoum agreed to create a new currency that would be used nationwide. Thus, in a few months' time, southern Sudanese could be ordered to exchange their money all over again. Jason Beaubien, NPR News.